If you're an avid furniture painter or just a beginner and you LOVE the look of aged, distressed furniture, this is one technique I insist you try. It only takes a few tablespoons of white vinegar, water and a spray bottle! Creating that weathered, distressed style has never been easier for me, and I can't believe I haven't experimented with this technique sooner! 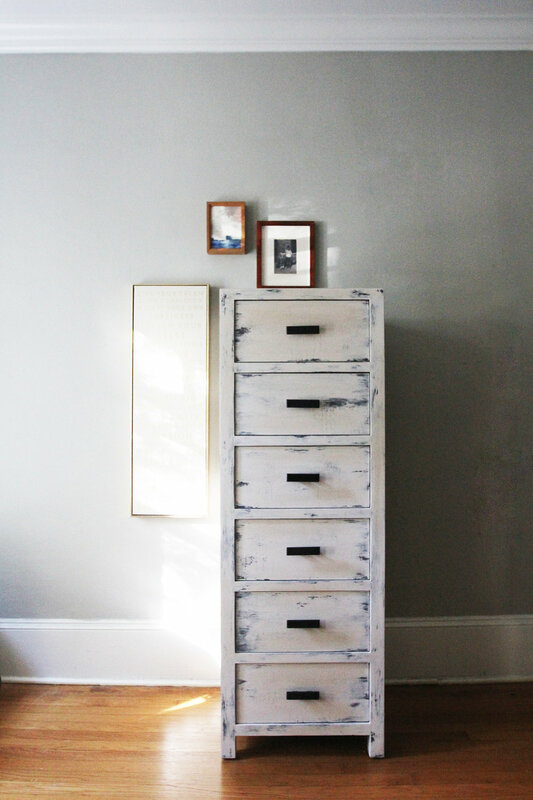 I painted this piece for a client who brought me this clean lined, tall and slim Crate and Barrel dresser. I actually think it looked nice the way it was, if a bit basic. My client sent me photos of an industrial metal cabinet he already owns and wanted this piece to coordinate with it since they'll be in the same bedroom space. Now this piece is SERIOUSLY distressed. We're talking legitimate rust, chipped paint, the whole nine yards. I could have gone this route, but he wanted something a bit more subtle, which I completely agree with. To try and recreate that same cream color from the metal cabinet, I mixed Annie Sloan's Old White with a bit of Honfleur, a deep chocolate color. Normally, I'd just use her color Cream, but Cream can sometimes read a bit yellow depending on the light, and that wasn't what I was going for. I applied one quick and messy coat of the paint and allowed it to completely dry. Complete coverage isn't what you're going for here, more of a haphazard paint style. I have to say, even just with that coat, the piece was already looking aged! But I wasn't done there. Here comes the magic of vinegar! I combined a few tablespoons of white vinegar in my spray bottle of water. I didn't measure, but I'd say it was 5 parts water to 1 part vinegar. I've used the water spray bottle technique for sometime now, but vinegar helps the paint crackle and gives it a disintegrated effect. I absolutely love it! This technique takes a bit of experimenting with. The way to make a piece feel truly aged and vintage is by having it look uneven and unintentional. The way I achieved this was through occasionally spraying the vinegar mixture, allowing drips to happen. I'd also take my paint brush, load it with just a hint of paint, and brush over the area I'd just sprayed. It creates a washed effect. I let all this dry, and then reapplied another thin coat of paint, again haphazardly. If I was really happy with how a certain area was distressed, I'd leave it be, but other spots where brushstrokes were a bit too obvious for me, I'd cover it with paint again. Instead of waiting for this coat to completely dry, I gave it maybe five minutes, and then came back in with the vinegar spray. By creating this multilayered finish, certain spots reveal the original wood stain, while others show layers of crackled paint. It gives the furniture a depth that can't be achieved with just one layer of paint and distressing. One thing to note when using this spray technique: the typical drying time for Annie Sloan chalk paint is really quick, but this extends the drying time quite a bit. It makes sense, you're essentially adding a good bit of water to the surface which just means more liquid that needs to dry. I was able to get two layers of distressing in one day, but took a second day to add a few more hits of vinegar and paint just to get the finish exactly how I liked it. I can't wait for my client to see the piece! The textures and layers really are best appreciated in person. I'm even more excited to see how it works alongside its inspiration piece. I'm getting ready to try the vinegar technique on a bookcase that will most likely be a practice piece. [but who knows, it might turn out great!] It's not solid wood like this dresser is, so I'm curious to see how the vinegar interacts with the laminated surface. Of course, I'll share my experience once it's done!